Building a list of subscribers with JV Giveaways is one of the easiest and least expensive methods around. It takes a little preparation, but once you have the basics in place it is as simple a method as you are going to find. There are lots of different Joint Venture (JV) Giveaways around, but today I’m going to go over the ins and outs of a set of scripts that is used by a large number of marketers. As I write this, there is a very large Joint Venture Giveaway promoting for contributors. You can sign up to contribute at http://HalePringle.com/giveaway. Some disposable income and a desire to buy solutions to the problem. The Fortune is in the List! Internet Marketers often hear “The Fortune is in the List!” and that makes the topic of “Building Your List” a hot topic among marketers. A rule of thumb is often quoted that states that you will average $1/month per subscriber. All of this assumes that you have built a list with the characteristics listed above. Note that having a good list is hard work!. A good list requires that you are actively working to build and maintain a good relationship with your subscribers. A stale list that you have not talked to in months becomes worthless. A list that you have done nothing but market to also becomes worthless. What is a JV Giveaway? The next important definition is “JV Giveaway.” The “JV” stands for joint venture. A giveaway is a short term project where several Internet Marketers get together (a joint venture) and create a web site with dozens or hundreds (or thousands) of free eBooks, audios, blueprints, software packages, white papers, etc. Each marketer tells their list about the “giveaway.” People go to the website and browse through the selections. If they see something they like they trade their email address for the item. The joint venture partners win by building their list with new subscribers. The consumers win by having a large selection of free material to choose from. (The partner who is hosting the JV Giveaway wins big by growing his or her list with the email addresses of all the consumers who visit the JV Giveaway site. There is More to it than Just Giveaways (Ethical Bribes). The JV partners have several opportunities to generate income from a Giveaway. We’ll go over those as we describe the ins-and-outs of one of the widespread JV Giveaway systems. Before we do that I want to go over what you would need to participate as a contributor in a JV Giveaway. 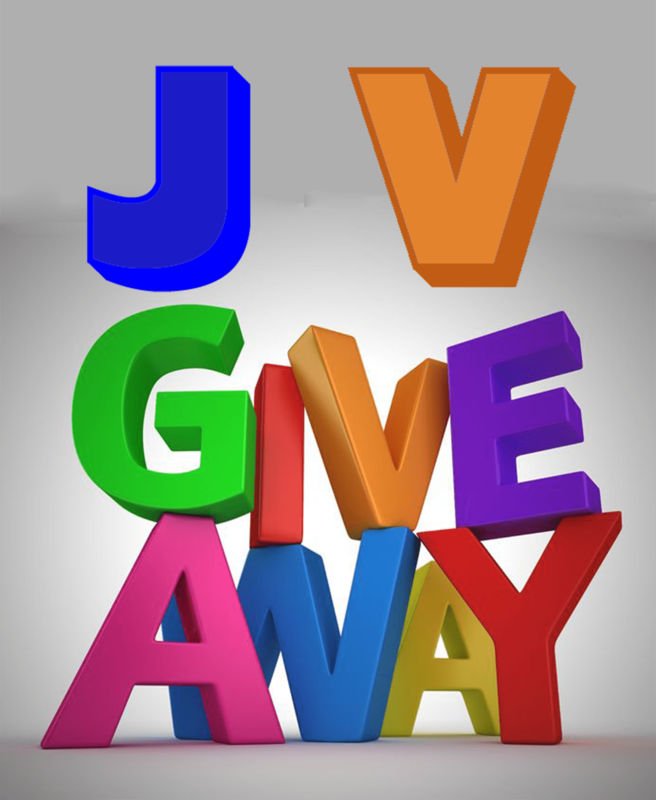 Here are the different benefits you can have by participating in a JV Giveaway. You can also generate sales by entering your “Special Offer” page on the JV Giveaway site. 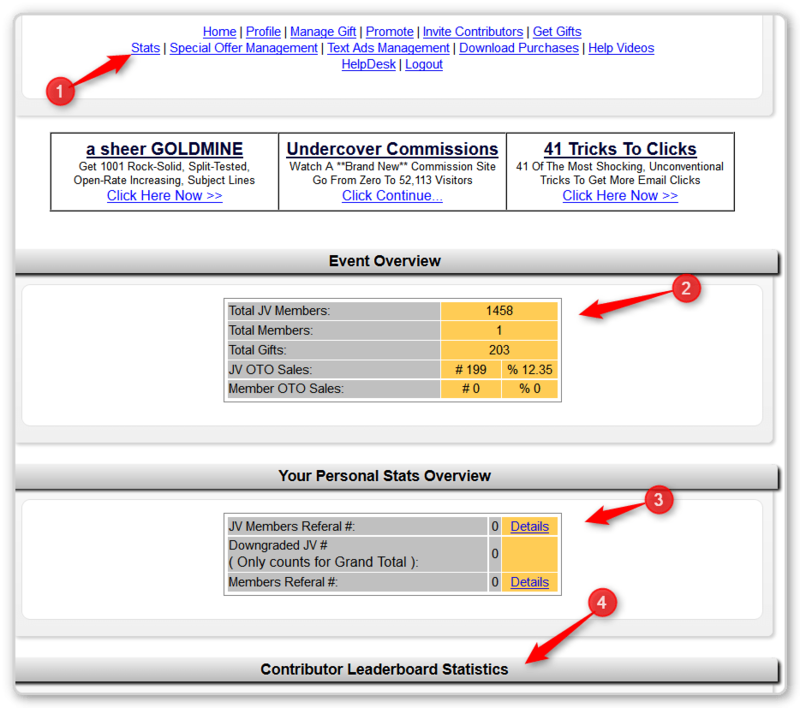 You can generate income by inviting visitors to the JV Giveaway. Some will upgrade to contributor and you share in sales. You can download Gifts that interest you without opting in to someone else’s list. I cover these in one of my free eBooks: Attraction Marketing: The Three Phases Explained. The important thing here is that you need to have some idea of your basic area of interest – the general niche you are going to be working with. You need to know this in order to build a list of the people interested in your niche. The more targeted your offers are, the more valuable your list will be to you. Something to Give Away (trade for an email address from a lead). These are called “Gifts” in the JV Giveaway lingo. A Squeeze Page for your Gift. A webpage or URL to deliver the free offer (your gift). JV Giveaways want you to provide a Gift for their visitors. Called an Ethical Bribe or an Irresistible offer, you need something that your target audience wants. Note that this assumes that you have identified a target market, what they need and why they should listen to YOU – all part of becoming an Attraction Marketer. The list of things is virtually endless and includes interviews, recipes, eBooks, lists of links, lists of resources, the name of a specialist and on and on. As long as it is important to your target niche, it works. NOTE: Many Giveaway Events do NOT allow Affiliate offers. They want something that is unique to you. This prohibition is often not true for the text ads -covered later – but it does apply to offers where you provide an image, a title, a description and a link to a Squeeze Page. 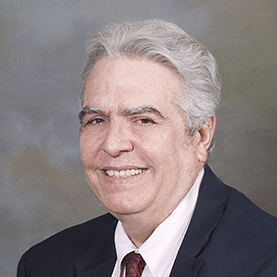 In the webinar Matt invited John Cornetta to explain the features of the JV Giveaway system. John is an expert at using JV Giveaways to build a list. 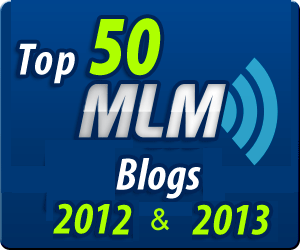 He has a site http://JohnConrnetta.com where you can get PLR (Private Label Rights) products for free. Basically you are allowed to edit the products and put your name in them and call them your own. I would strongly recommend that you change the title and the cover page before you use one. You don’t want people to say “Oh I’ve seen that before.” You can use http://Fiverr.com and pay $5 to have someone create a new cover page for you. A few hours of editing, a $5 gig at fiverr.com and you can have your own product ready to go. You can also Google for keywords relevant to your niche and the letters PLR, for example ‘”weight loss” PLR’ If you put this in Google (without the single quotes, you will find literally hundreds of eBooks you can edit, call your own and use in a JV Giveaway. A squeeze page is a web page where you tell visitors about your offer and have a form that they can fill out giving your their email address (and perhaps more information). The site LeadPages.net (Sign up at http://HalePringle.com/leadpages ) is widely talked about as a good benchmark. They offer fill-in-the-blank pages and will host them for you. They are not free, but they allow you to create professional looking squeeze pages quickly and easily. LeadPages.net has an integration feature that allows you to copy and paste sign-up form HTML data into their squeeze page templates. Leads signing up with the LeadPages.net forms will be added to the list you designated in AWeber. #4 A Webpage or URL to Deliver the Free Offer. Again if you do not have a website, LeadPages.net has pages that are designed to deliver your digital products. 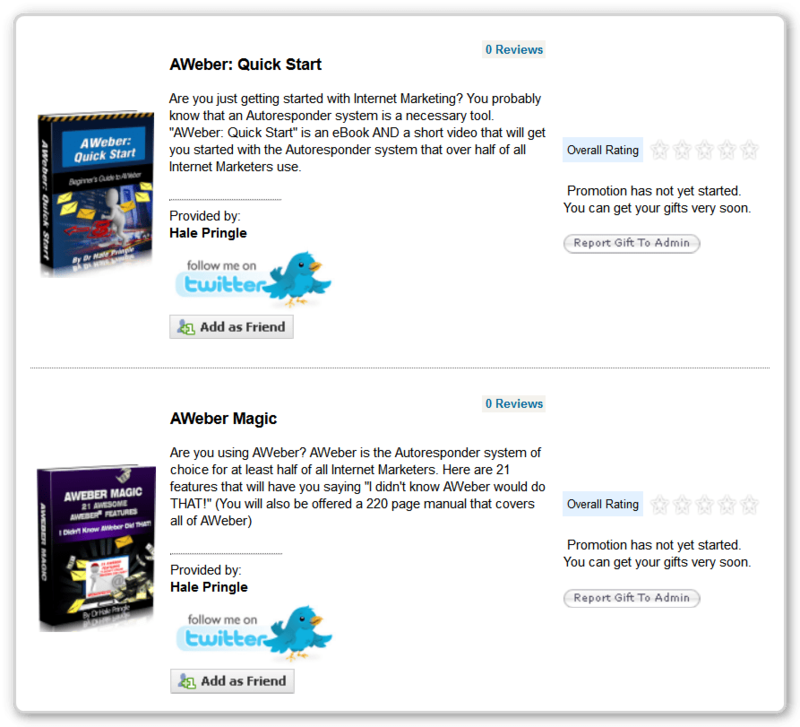 As I describe in my eBooks on AWeber you can also give download links in your AWeber follow-up emails. You can use sites like Dropbox to host your pdf or audio file on the Internet. A URL that allows someone to access your the paid product directly (without a sign-up). 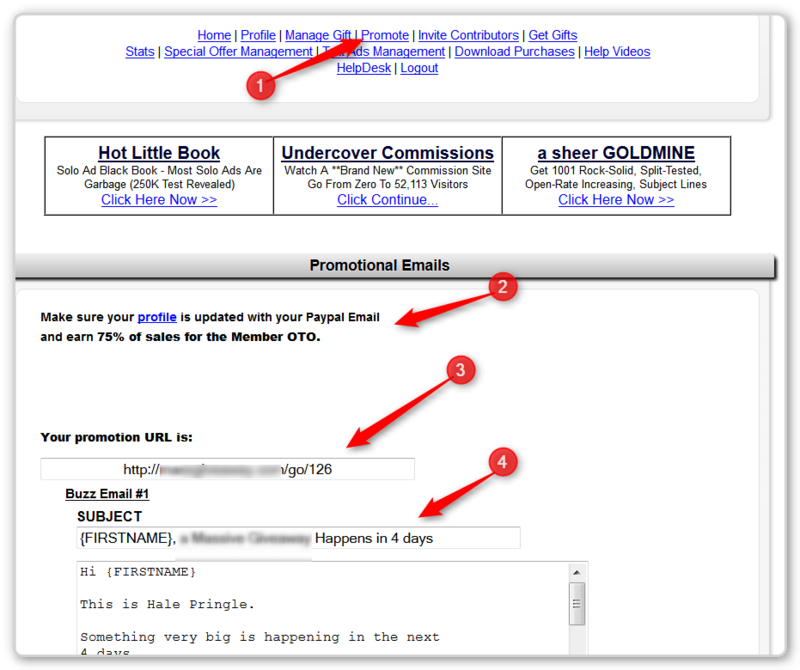 This is usually called a One-Time-Offer (OTO) and the squeeze page for it is shown right after a Lead signs-up for your Free Offer. JV Giveaways do NOT allow you to send people to a Squeeze page where they MUST buy something in order to get the free offer, but you can make money buy selling Upsells after the Lead has subscribed for your free offer. Again Leadpages.net has pages for this. 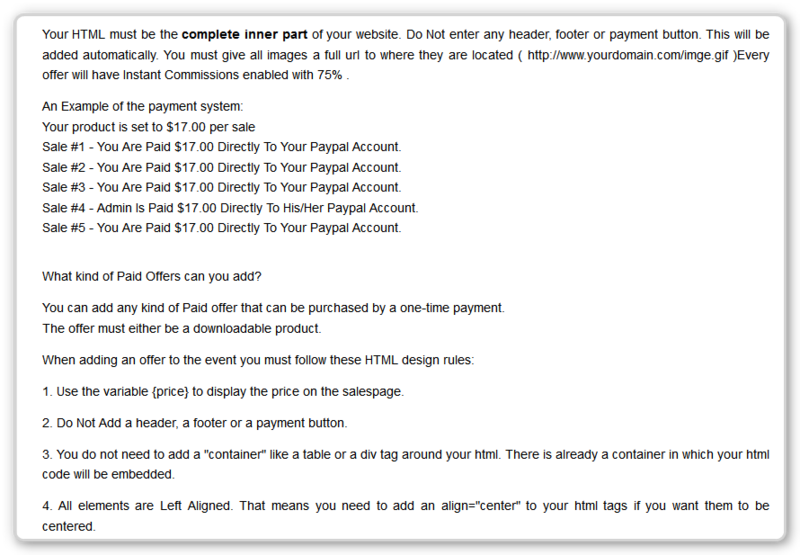 PayPal is widely used by Internet Marketers to put BUY NOW buttons on their One-Time-Offer pages. Having a product you can sell is important. It is not necessary, but it is important. Participating in JV Giveaways as a contributor is inexpensive enough (often between $10 and $20) that having a paid product to help defer costs isn’t really an issue. When you create Pay-Per-Click ads on Facebook, Google, YouTube, Twitter, etc. the paid product becomes an important asset to help defray the costs of the advertising. The JV Giveaway system has a place for you to insert an ad. This ad will be for your Paid product. You are not allowed to have an BUY button on this page. I’ll show you that below in the screen shots. 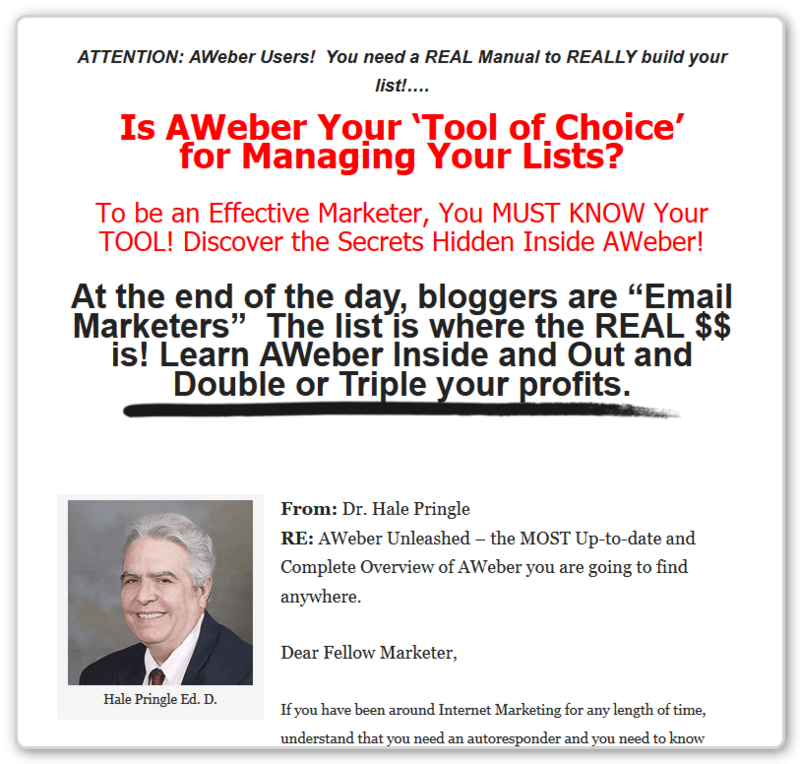 You can do this with an eMail delivered by AWeber (or another autoresponder) or send the customer to a special Thank You page with download links on it. 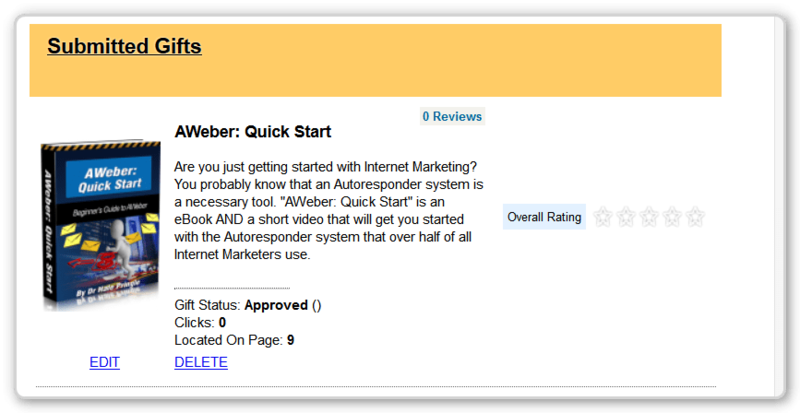 (Again LeadPages.net can do this for you). For PDF files, you can have a URL where people can click on the URL and their browser will download the file automatically. 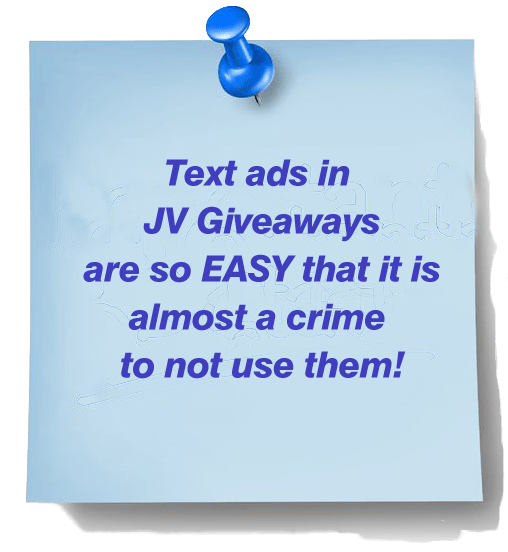 If you place the ad for your paid product in the JV GIveaway system, you will need a page or URL where buyers can be directed by the JV Giveaway site to get their downloads. There are literally hundreds of ways to build a list. Internet Marketers are constantly coming up with new ways to drive traffic to a place where they can capture the email addresses from Leads. Pay-Per-Click, Pay-Per-View, Blogging, Solo Ads, Media Buys and giveaways are some of the more common ones. We are going to look at the JV Giveaway system here. There are several different aspects to most JV Giveaways and it is very easy to become confused. At the very lowest level, you register as a contributor for free. Usually you are allowed to enter one Ethical Bribe and collect subscriber email addresses on that one offer. 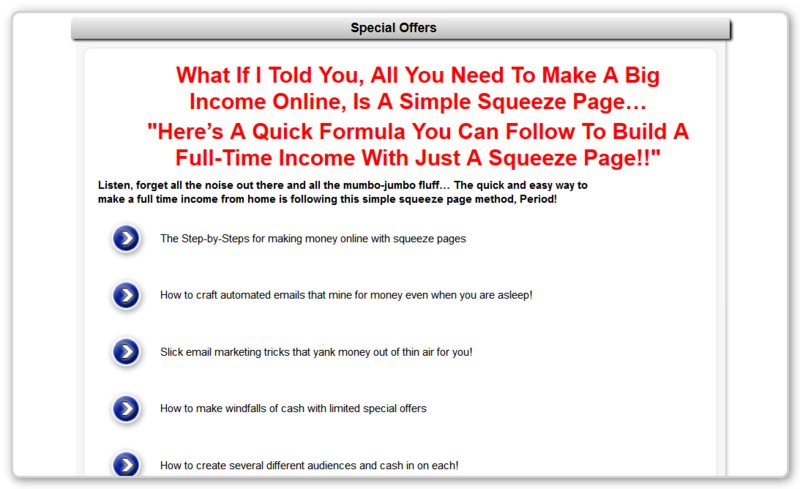 Leads go to your squeeze page, so if you have a One-Time-Offer, you might make some money. If the JV Giveaway has three levels, the intermediate level is usually a downsell from the third level. You may be allowed to create a Special Offer (One Special Offer is shown to contributors when they register (and sometimes when they login.) You can charge for the special offer and you split the sales between you and the JV Giveaway Organizer. Often the split is 50-50. You have an affiliate link to tell your list (or run ads) to bring other contributors to the JV Giveaway. If they upgrade from the FREE level you split the fee with the organizer – often 50-50. Once the JV Giveaway opens, some visitors will upgrade and you share the profits with the orgnanizor. You are allowed to browse the offerings and download any that you like WITHOUT going to the other contributor’s opt-in page and signing up for their list. You can see there are four different benefits here 1) subscribers (and perhaps OTO profits), 2) Leads sent to your Text Ad URLs, 3) cash from the Giveaway event itself and 4) Ethical Bribes downloaded legally without joining someone’s list. The number of gifts you can enter, the number of text ads you can enter, the number of Special Offers you can enter and the percentage you keep from sales made on the JV Giveaway site all go up with you take this option. In most cases, if you are going to participate, the Advanced Level seems to be the best option – by far! NOTE: The JV Giveaway script is has many options and some people choose to spice them up. My point is that what you see may vary from what I’m showing you here. As you can see there is always a place for people who want to become contributors to sign in. There is also a place for existing contributors to login. 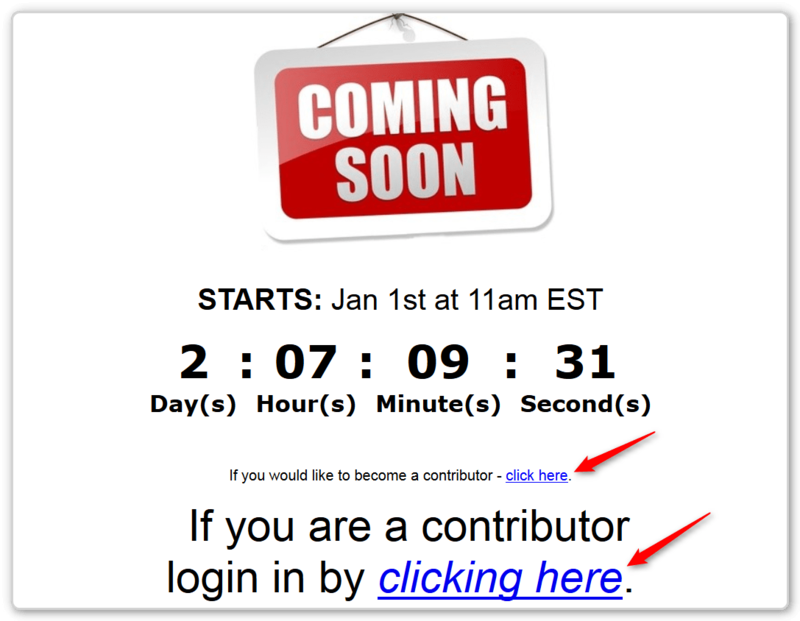 There are three steps you go through when to Register to become a Contributor. Accept or Decline the Organizer’s Offer to Upgrade to a Paid Contributor Account (and get more benefits). This one requires that you enter your password twice and the “Register Your Account” button is not active until you have entered the same password twice. Step #2 – Accept or Decline a “Special Offer” from one of the other contributors. When contributors login to the JV Giveaway they are shown one or two of these Special Offers. The offers are rotated among all contributors who submit offers and get them approved. These offers are often low cost and the sales are shared with the organizer of the JV Giveaway. For example, at the intermediate level the organizer would get the proceeds from the first sale and you would get the proceeds from the second sale. At the Advanced Level there would usually be one sale for the Organizer followed by three sales for you. Then the cycle starts over. You do NOT get a subscriber to your list from this transaction. I believe that something similar can happen for visitors, but don’t remember ever seeing it. Here is where you pay for the product. Note that this PayPal button belongs to the JV Giveaway organizer. It is not part of the Special Offer Page. After you pay you will almost always see a screen with a scrolling status bar. It seems to take 10 minutes more often than not. The next screen you see is where the JV Giveaway Organizer offers you a chance to upgrade from the FREE level. While this is a One-Time-Offer, you can usually upgrade later, it will just cost a little more. I saw one recently where the cost was 70 cents more. When you pay for the upgrade either the organizer OR the person who provided you with affiliate link will get the money. It is easy to think of a JV Giveaway as simply a place to grow you list. Sharing the profits from the Special Offer shown during registration and sharing the profit from contributors (and visitors) upgrading are the two ways you can make money directly from a JV Giveaway. Again I will note that if you are going to contribute, this is usually a no-brainer. As I mentioned before the numbers vary from one JV Giveaway to the next. The organizer chooses the options. I have seen as high as 6 Gifts allowed at the Premium level and 75% commissions. Once you see the menu, you have completed the Registration process. Promote to visitors. At least one is required from your affiliate link. Sometimes more are required. The arrows are pointing at the Profile link where you edit your Profile and examples of the Text Ads we mentioned earlier. If you are using the FREE Basic Contributor Level you usually will not be able to enter any text ads. #1 – You can change your password here. #2 – Browse you hard drive and upload a picture. I suggest a smiling head shot. You want people to learn to know, like and trust YOU. A picture of Goofy isn’t YOU. 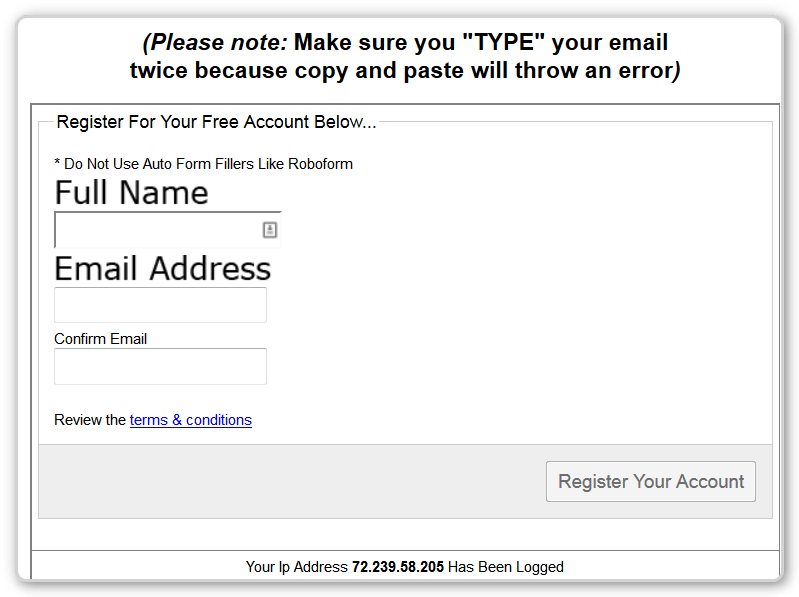 #3 – Your PayPal id (the email address you use for PayPal). This is critical since it is how the organizer pays you! #4 – Your Clickbank id. I don’t think that this is used yet. #5 – Your Twitter name – be sure to add the “@”. When your Gift is displayed, the page also has links that encourage visitors to follow you on Twitter and Friend you on Facebook. As a total aside, I find it very convenient to save my profile information is Evernotes. That makes it very easy to find when I sign up for the next JV Giveaway. After you have saved your information, the next step is to Manage Your Gift(s). Clicking on the “Manage Gift” brings up the page where you can enter information about your Gift(s). If you have paid for the advanced levels, you will be offered a chance to enter more than one gift. #2 – Browse your hard drive for the image that goes with this Gift. (Sometimes you can use your picture if people know you.) I’m not sure what the LOGO is used for. #4 – Enter a long description. The system will not let you go beyond the maximum number of characters allowed. It will change the count every time you type a keystroke. After you enter the information that the visitors can see, you must complete the setup with the following information. #1 – Hovering over the Blue “Info” buttons will pop-up help information. #2 – Enter the URL that you want visitors to go to if they like your Gift. This is your squeeze page where they will give you their email address. You can NOT sell on this page, but you can send them to a One-Time-Offer Thank You page (with a product they can purchase) after they sign up for your gift. #3 – The direct Download Link. 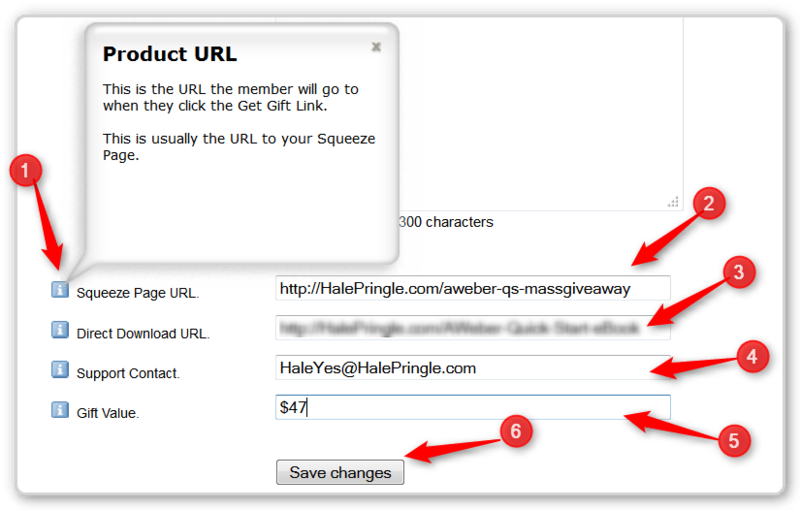 This URL is the link that Contributors will use when they download your Gift WITHOUT opting in to your List. 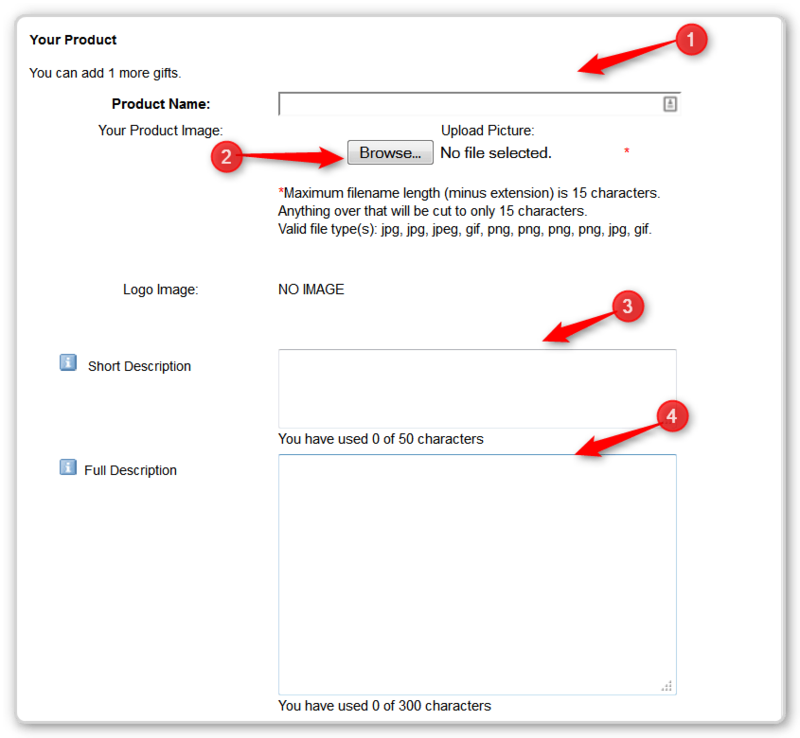 #4 – An email address where visitors can get support if there is a problem with your Gift. #5 – A reasonable price for this “FREE” gift. #6 – When you have entered the top and the bottom information, you Save Your Changes. Once you save your information, it will change to a “Pending” status. I usually find that they are approved automatically within a minute or two. Note: You are not allowed to enter the same give more than once. Note 2: I found that small eBooks that I created from longer Blog posts generated almost as many subscribers as my major works. The bottom line is put something up that you think your target audience would be interested in. Again, I find that saving my ads and the various links for my eBooks in Evernotes makes the information easy to find and copy and paste when I sign up for the next JV Giveaway (or create a PPC ad). Here I am showing #1 a Tag I use to indicate each of my eBooks, #2 my Squeeze Page URL, #3 my download links, #4 and #5 the text for my Gift’s description in JV Giveaways. Off the screen is a path that shows me where to find the eBook cover image that I upload to the JV Giveaway site. 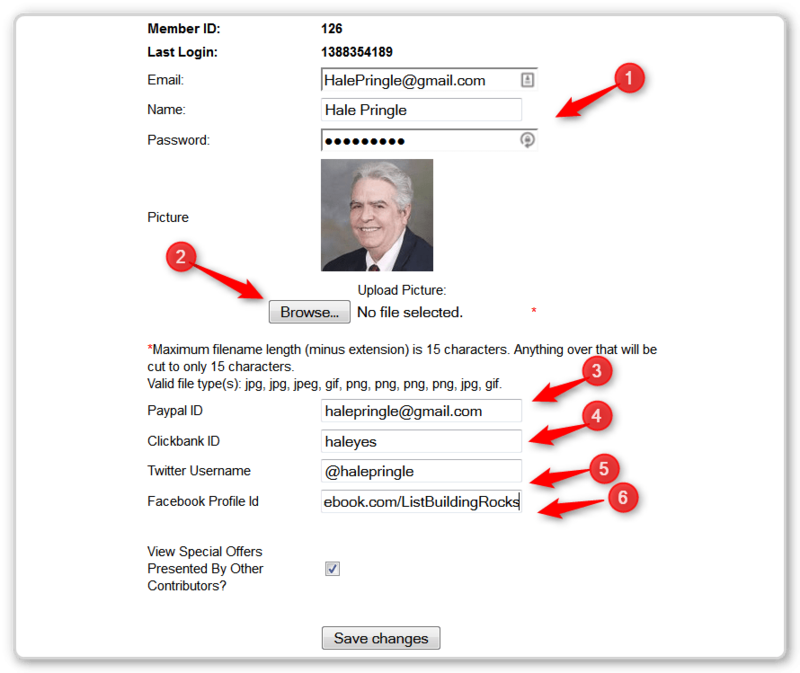 The last step for a basic level contributor is to promote to Potential Visitors. You can email your list, post on Facebook or Twitter, or pay for ads. #1 – Click on the Promote Link. #2 – This message changes based on the level of participation you purchased. 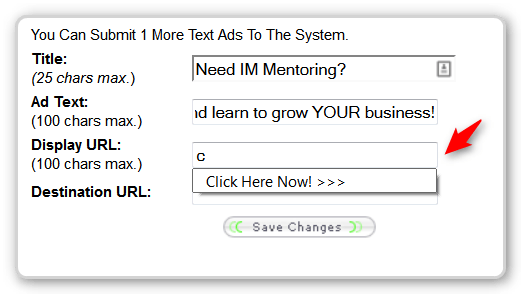 #3 – This is your Promotion Affiliate URL. 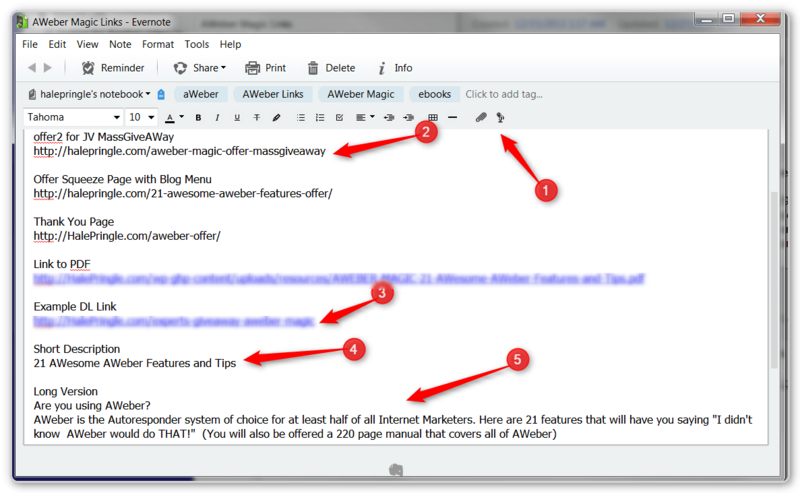 #4 – This is SWIPE copy emails you can use to email your list. NOTE: This swipe code is usually exactly the same for every Giveaway. You are going to want to edit it (heavily) so that your list doesn’t see the same exact praise for different people. That would show that you didn’t write the emails and that you didn’t really mean what you are saying. 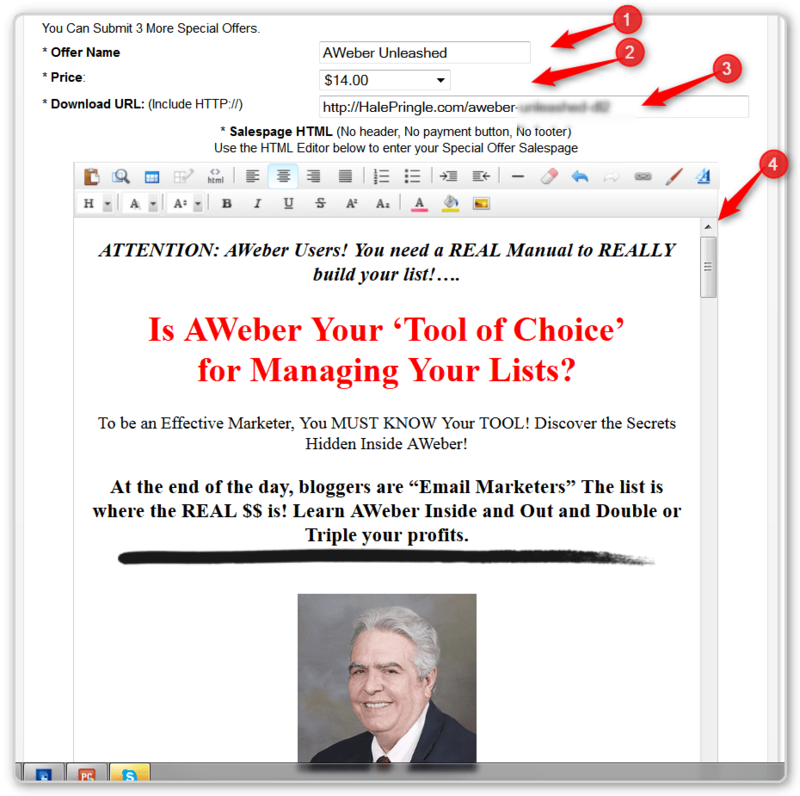 #2 – This tells you that there is Swipe Copy below that you can use to email your list. 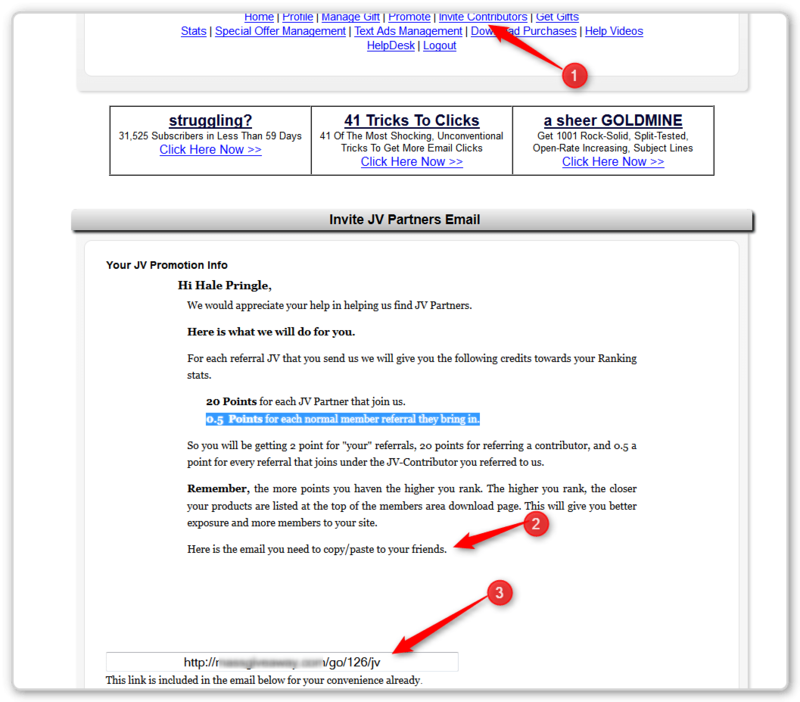 #3 – This is your affiliate link. When new contributors sign up using this link you get a percentage if they upgrade and a percentage if they buy the Special Offer shown right after they register. The percentage you get is determined by the rules the Organizer set up and the level of participation your purchased. The following sections apply to those you paid for one of the upgrades. It is well worth the small additional effort. There are three things you can do as a Paid Contributor. #1 – There are two number 1’s above. The small one at the top shows what displays. The larger one shows where you put that information when you edit a Text Ad. #3 – THIS IS WHAT SHOWS! You can put the URL there, but a Call-to-Action is much better. #4 – This is the URL where visitors go when they click on the text ad. NOTE: It is suggested that you use your best offer and duplicate it for all of your Text Ads. This will get your the most views. As shown above, after you have entered one ad, you only need to enter one character and then select the value that appears when you start to enter the second ad. The Text Ad system allocates you “credits.” You place these on your ads and every time one of your ads is shown, a few of the credits are expended. You start with 10,000 credits to allocate among your ads. You generate more credits when contributors or visitors using your affiliate link visit the Giveaway Site. #2 – Even though you are allowed 25 characters, your actual headline will often need to be shorter. This looks bad, so I edited it. #3 – This is where you enter credits. When you do, they are removed from the top line that currently shows 10,000. #4 – You can see that 5 credits are allocated for reasons unknown 🙂 You can also see that the JV Giveaway keeps track of the impressions and the number of clicks your Text Ad generated. #5 – There are three buttons here – pause this text ad, edit this ad, and delete this ad. Here you can see one of the Text Ads I entered. I used the letters IM in some and left them out in some. I’ll check which version works better as the Giveaway progresses. This is without a doubt the most confusing part of the JV Giveaway system (at least it was for me). It is also totally optional. Special Offers are shown to people as they sign up for the site. The organizer and the contributor share the profits. You might get 25%, 33%, 50%, 66% or 75% depending upon your level and how the organizer set things up. (Basically the organizer get the first sale and you get the next one, two or three sales depending upon the percentages. You do NOT get a subscriber on your list from these sales – just the cash paid into your PayPal account. Before you start on the JV Giveaway site, you may want to Clone one of your existing sales pages (I use a plugin called “Duplicate Post”). You can modify the Sales Page in your WordPress blog or in LeadPages.net, etc. 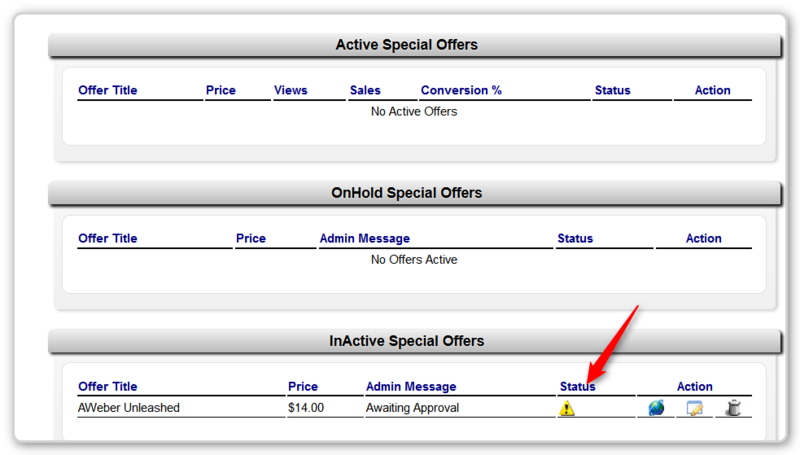 On the JV Giveaway site, you click on the “Special Offer Management” menu option. You will see a few fields that you need to fill in. #3 – Page or URL where purchasers will be sent to get their product after they purchase the product. (Note: If you are offering bonuses, you will need a page there whey can download the main product and the bonuses.) I like to use a Pretty Link here since it will keep track of clicks. I just like to see what is happening on my own site. #4 – HTML Editor where you enter your ad. NOTE: Usually it is not worth the effort to create a new Sales Page just for this. Copy and Paste one from your Blog or from LeadPages.net. NOTE: You are not allowed to have links or BUY NOW buttons in YOUR text. 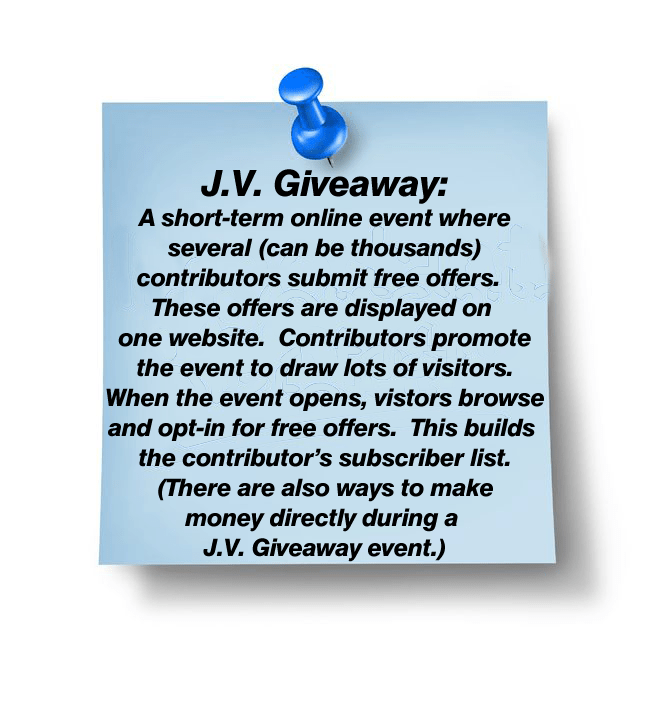 The JV Giveaway organizer will add his to be bottom of your page. There is not reason not to copy the same Special Offer if you are allowed more than one. That will increase the number of people who see your Special offer. Once you save your offer, it will be placed on hold while the software (and perhaps a human) check that the page you submitted meets the Organizer’s specifications. If there is a problem, you will see a note here that tells you what the problem is and how to fix it. Here you see that the Special Offers have been approved and each has been shown a few times. When you click on the “Stats” menu option you see how your Gifts are doing and the leaderboard – how much money you have earned. Quite often the organizers will be running competitions among the Contributors in order to encourage more promotion of their Giveaway. Note: This Stats Screen shot was taken before the Giveaway actually opened. #2 – An overview of the entire JV Giveaway. Note: There are 1458 Contributors at this point and only 203 Gifts. This is common. Your offer will get good exposure if you just enter the information!. #4 – (Not shown) the Leader Board. Click on the Get Gifts menu option and you will see Gifts placed in the system. You can click on any of them and get the download for FREE, without opting in to a list. This is pretty much what the Giveaway will look like when it goes active. Here you can see two of my offers. Once the JV Giveaway event goes live (is open to visitors), you will be able to click on one of the items and download it. This uses the “Download Link” contributors provided when they entered the information on each Gift. It will NOT take contributors to the Squeeze page link that was provided at the same time. Visitors are sent to that link. There are three options on the example I have been using here that I am not going to cover. Download Purchases – if you buy a Special Offer, you will get an email with the Download Link. You can also click on that link here. HelpDesk – Fill out a support ticket if there is a problem. In this post, I have covered joining a JV Giveaway event as a Basic Level Contributor and as a Paid Contributor. The opportunity to download Gifts without opting into someone’s list. Save Your Entries – it makes entering your Offers in the next JV Giveaway MUCH easier. I use Evernotes. Modify the swipe files to your voice. They are the same in every JV Giveaway I have seen. Get several free offers in place. In conclusion JV Giveaways are an easy way to grow your list! Lisa Magoulas recently posted..Do you have a balanced life? as role models. In this series, we will look at some common sense areas to begin using background checks to your church. s humour the old man because, after all, he is the boss. and that means you probably will also. mixed mushrooms, yam and other materials, has been enhanced more suitable for local tastes. fresh salmon, Capelin, squid and other cold and refreshing. relatively light, fresh and tasty. Magnificent site. Lots of helful information here.